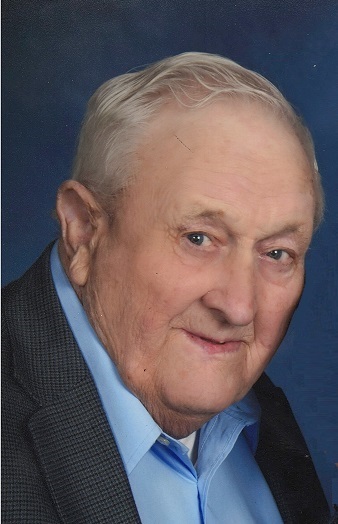 Lavern Carl Magnus, age 93, of St. Peter, Illinois, passed away at 11:30 p.m. on Sunday, March 17, 2019, at St. Anthony’s Hospital, Effingham, Illinois. Funeral service will be held at 11:00 a.m. Thursday, March 21, 2019 at the St. Peter Lutheran Church, St. Peter, Illinois. Pastor Ryan Meyer will be officiating. Visitation will take place from 5:00 p.m. to 7:00 p.m. on Wednesday, March 20, 2019 at the Pagel Funeral Home, St. Peter, Illinois. In lieu of flowers, memorials may be made the LWML or donor’s choice. Lavern was born January 24, 1926 in Fayette Township the son of Paul Magnus and Ella (Graumenz) Magnus. In his younger years he had several occupations. He worked at the East St. Louis railroad yard switching train cars. He also worked at the Illiopolis defense plant where he was employed in the manufacturing and warehousing of live ammunition for the WWII war effort. He was in Chicago getting his physical to join the Army when the war ended. Lavern married Esther Marie Campe on October 17, 1948 at the Zion Lutheran Church, Altamont, Illinois. Together, they lived in one house with his three sisters and Lavern’s mother. As his sisters got married and Lavern’s mother remarried, Lavern and Esther settled down to raise chickens, milk cows, and farrow pigs. As if that wasn’t enough, he also custom filled silos and did custom combining. Lavern always said he never worked hard he just worked all the time. Lavern was born into a farming family and when he was 8, his family moved to the present farmstead where he resided until his death. He often talked of his brother and him plowing with mules and one bottom plow. Lavern’s father, Paul, passed away in 1948, at this time Hilmer, 14 and Lavern 12, took over the farming and Arlene, Melinda and Delores tended livesock, gardened and helped maintain the farm. Lavern’s favorite pastimes were raising and watching his family raise cattle. He enjoyed bowling on three competitive teams, and later bowling in a couple’s league, and WOW could he hit a softball. He was a member of the St. Peter Lutheran Church. Lavern is survived by his wife of 70 years, Esther Marie Magnus of St. Peter, Illinois; three sons, Larry Edward (Wife, Twila) Magnus of St. Peter, Illinois, Lynn Lavern (special friend, Missy) Magnus of St. Peter, Illinois and Scott Allen (wife, Debbie) Magnus of Carlyle, Illinois; eight grandchildren, Torrey (wife, Jill) Magnus, Tyler Magnus, Tiffany (husband, Dean) James, Staci Jahraus, Shannon Magnus, Scarlett (husband, Joe) Vanzo, Sawyer Magnus, and McKenzie Magnus; 10 Great-Grand-children, Fischer, Madyson, Max, Aidan, Avery, Alec, Nicco, Charles, Dexton and Davin; one brother, Hilmer (wife, Ruth) Magnus of St. Peter, Illinois; two sisters, Melinda (husband, Orville) Hinton of St. Elmo, Illinois, Delores (husband, Darrell) Ford of Tuscola, Illinois; four sister-in-laws, Alice (husband, Vernie) Jones of Bethany, Illinois, Lorene Shroeder of Altamont, Illinois, Norma Jean Campe of Altamont and Belva Schaefer of St. Peter, Illinois. Lavern was preceded in death by his parents, Paul and Ella Magnus; sister in infancy, Helen; step-father, August Bergmann; sister; Arlene Lee, brothers in law; Harold Campe, Delbert Campe and Eldon Campe.